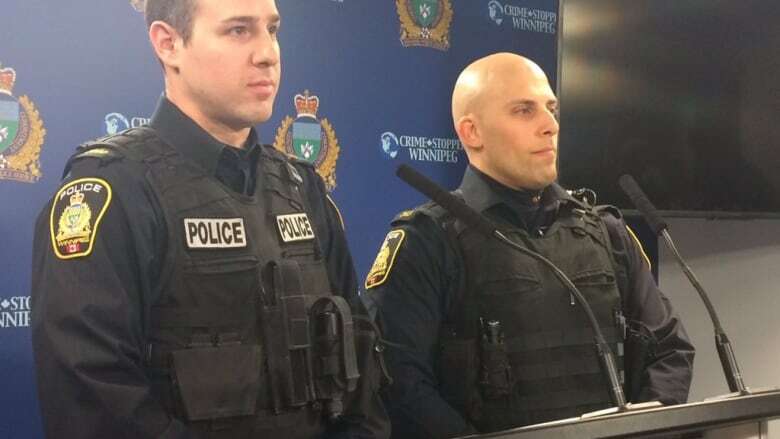 Two Winnipeg police officers who rescued several people from a condo fire two years ago received awards for their bravery from the Governor General on Tuesday. Two Winnipeg police officers who rescued several people from a condo fire in February 2017 received medals of bravery from Gov. Gen. Julie Payette on Tuesday. "Me and my partner ran across the road and into the building, and we were just looking out for the people, before we thought about our own safety," said Const. Trevor Bragnalo, one of the two officers to receive the honour. Bragnalo and his partner, Const. Ashley Thompson, were among 40 recipients honoured by the Governor General in a ceremony earlier this week. While at the end of their 10-hour shift on Feb.25, 2017, Bragnalo and Thompson leapt into action after seeing a condo engulfed in flames in the city's West End. "We were just driving on Sargent Avenue, and we just raced over to it," he said. As Bragnalo called in the fire, Thompson went to the back of the three-storey building where he could hear people screaming for help. The duo then climbed a fire escape into the building, making their way to the second floor where a handful of people were trapped. "There was one family with small children, so they needed help getting out because the kids were panicked and scared," he said. The officers then began going from room to room, checking the closets and under beds to ensure everyone was able to get out. Thompson escorted several people down the fire escape, as the building began to fall apart. The officers then went up to the third floor, where Thompson knocked on the window of a room where a man was asleep. "He was able to wake him up by just banging on his window," Bragnalo said. Eventually, after grabbing the man and rescuing the last few people from the third-storey, the realization of what they had done began to set in, he said. "Between me and my partner, I believe we pulled seven people out of the fire." Despite the lives they saved and the honour bestowed on them, Bragnalo doesn't think the term hero is suited for the officers. "I don't really think we are heroes. We talked about it, and that's just our job. We signed up to do this," he said. Two other Manitobans were also honoured at the ceremony at Rideau Hall. The pair were honoured to be in the presence of people they deem real heroes, Bragnalo said. "They're just these normal people doing these heroic acts, jumping and helping as much as they can with no training," said Bragnalo. "It was quite the experience. It was overwhelming in a way." Former NFL player Israel Idonije, who grew up in Brandon, Man., was also honoured for his charitable work helping disadvantaged youth in Chicago, Winnipeg and West Africa. Manitoba musician Robb Nash was honoured for speaking on the topics of suicide, depression, bullying, self-harm and addiction at his various concerts.